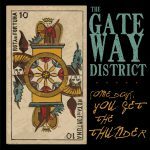 The first Gateway District album. Scrappy, fast and kind of raw. I think we recorded this in 4 days or something which looking back seems insane. We probably tried to cram too much into this one, but it’s got some of my favorite songs.